I do all the singing, lyrical composition and playing of all the instruments (flutes, piccolo, guitars, keyboard, saxophone and synth for additional specialty instruments) you hear in my sample recordings. I mix it all together in my small home music studio to self-produce the recordings you hear and the CD's that are available on Amazon. 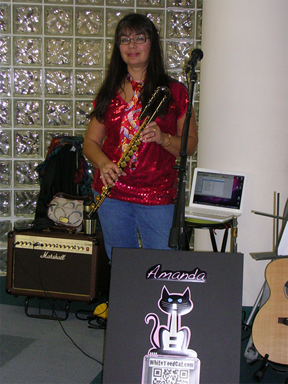 Additionally, I do live gigs as "Amanda and the White Toed Cat". I can do it by myself with my own self-produced background musical accompanyment or as a guest invited to perform my flute or sing with another band. (C) Copyright 2005 - All Rights Reserved - Permission must be obtained from web site owner to reproduce, copy, or distribute anything on this web site. This also means that you do not share this web site link on any social media site without expressed written permission from the web site owner.